B elow you will find our quick start guide for conducting research in Jefferson County. 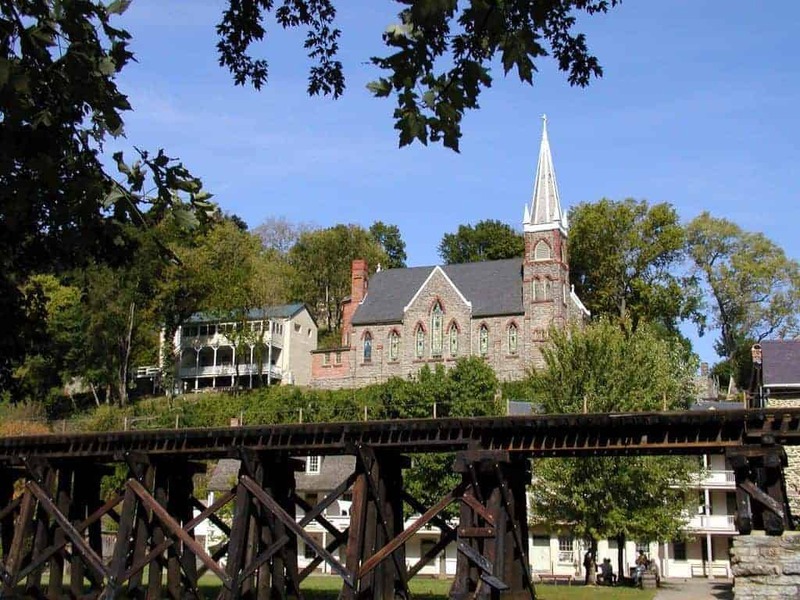 The guide includes links to many different websites and is designed to help you get acquainted with the various resources available specific to Jefferson County, while giving you tidbits of history on a “must know” basis. While we designed this guide to be a tool to point you in the right direction, it cannot be considered a complete guide. 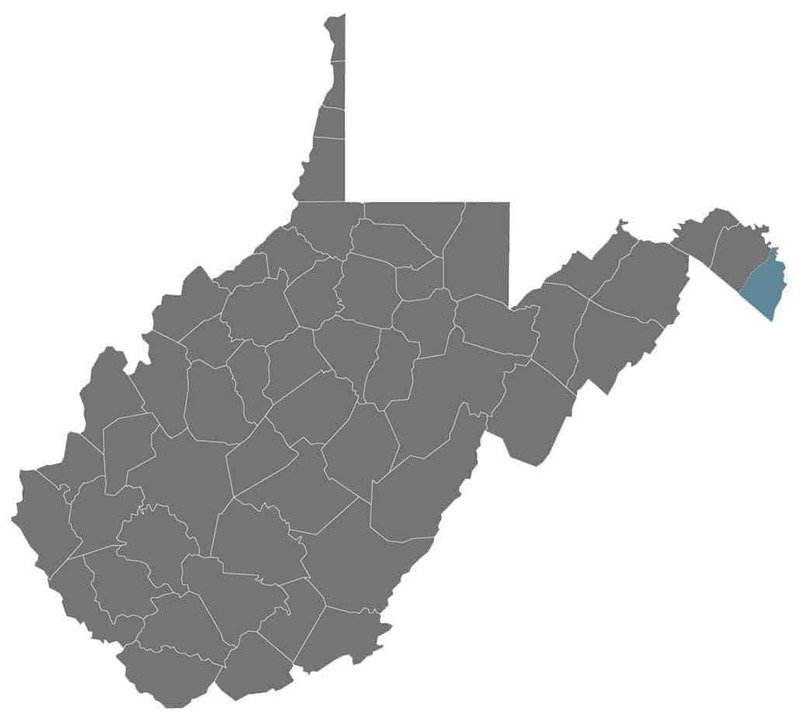 A county map of West Virginia. Jefferson County is highlighted. Jefferson County, named for President Thomas Jefferson, was formed from parts of Berkeley County on January 8, 1801. When drawing up his will, Charles Washington set aside a town square for county buildings in Charles Town if a split from Berkeley County was to take place. The formation of Jefferson County took place after his death, and the county seat was placed in the hands of his town, Charles Town. 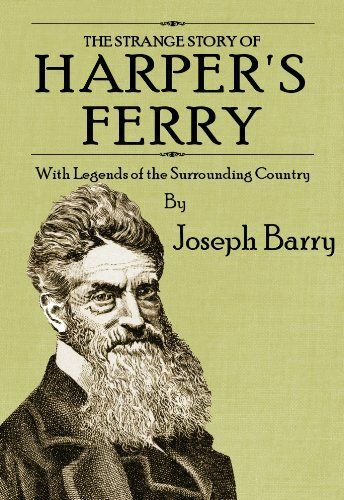 J efferson County, was formed January 8, 1801 from Berkeley County, (West) Virginia. President George Washington’s brother, Charles Washington, petitioned for the county’s formation. A previous Jefferson County, Virginia had already become Jefferson County, Kentucky by the time the present day Jefferson County was formed and named. Both of these counties were named after Thomas Jefferson, who was sworn into office two months after the new Jefferson County was formed. From 1738 to 1772 present day Jefferson County was part of Frederick County, Virginia. It was very briefly part of Orange County, Virginia, from 1732 to 1738, and from 1720 to 1734 was part of Spotsylvania County, Virginia. The new Jefferson County, Virginia became Jefferson County, West Virginia in 1863 during the heat of the civil war. Interestingly enough, Jefferson County was not part of the original “West Virginia”. However, although the majority of citizens of Jefferson County wished to stay part of Virginia in lieu of becoming a Union state, Jefferson County was forced into the Union after a botched “election” shortly after the formation of the state. The Union needed Jefferson County under their control for strategic reasons. An absolutely wonderful resource for conducting any type of research pertaining to Jefferson County, West Virginia, William Theriaults guidebook goes into detail about manuscript holdings and where to find other relevant records pertaining to your search. Read it free. P resident George Washington’s brother, Charles Washington, was the founder of Charles Town, the county seat (commonly misspelled Charlestown; Charlestown is also an older spelling of the town). 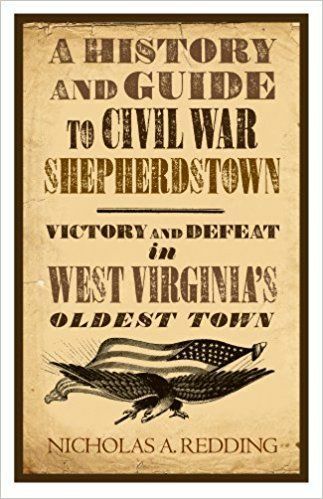 Towards the end of the Civil War, the county seat was briefly moved to Shepherdstown, only to return to Charles Town in 1872. In 1803 the first courthouse of Jefferson County was constructed, only to be torn down and rebuilt in 1836 into the present day courthouse. There was a fire in 1803, however records from 1801 on still exist. At the beginning of the Civil War, Jefferson County records were relocated to Alexandria, Virginia and escaped the war unscathed. Records were returned to the county after the war. Other records must be obtained in person or by written request. The County Clerk’s office is located in the courthouse. You can reach the office by phone at (304) 728-3215, or by mail at P.O. Box 208, Charles Town, WV 25414. This clerk holds the records for any type of court proceedings in Jefferson County. The Circuit Clerk’s office is located behind the courthouse at 119 North George Street in the old Jefferson County Jail in Charles Town. You can reach the office by phone at (304) 728-3231, or by mail at P.O. Box 1234, Charles Town, WV 25414. Four official battles were fought in Jefferson County, with many run-ins, campaigns, and stand-offs fought in between the official battles. The official battles are listed to the left. 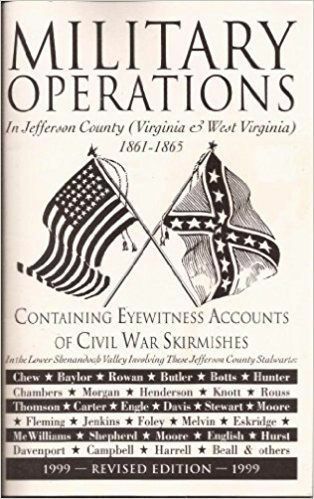 Many other operations are well documented in Jefferson County; the book, Military Operations in Jefferson County 1861 – 1863, listed below, is a great resource for learning of these skirmishes. The below materials relate directly to Jefferson County during the civil war period. Listed below are online resources for Jefferson County Civil War Research. 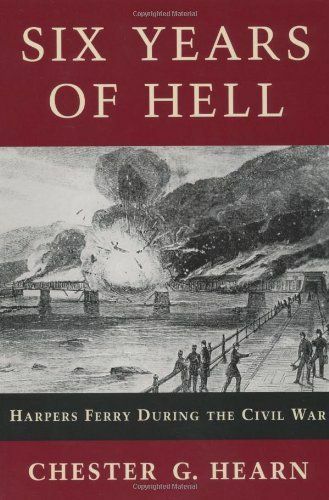 A chronological retelling of Jefferson County, Virginia, during the Civil War. 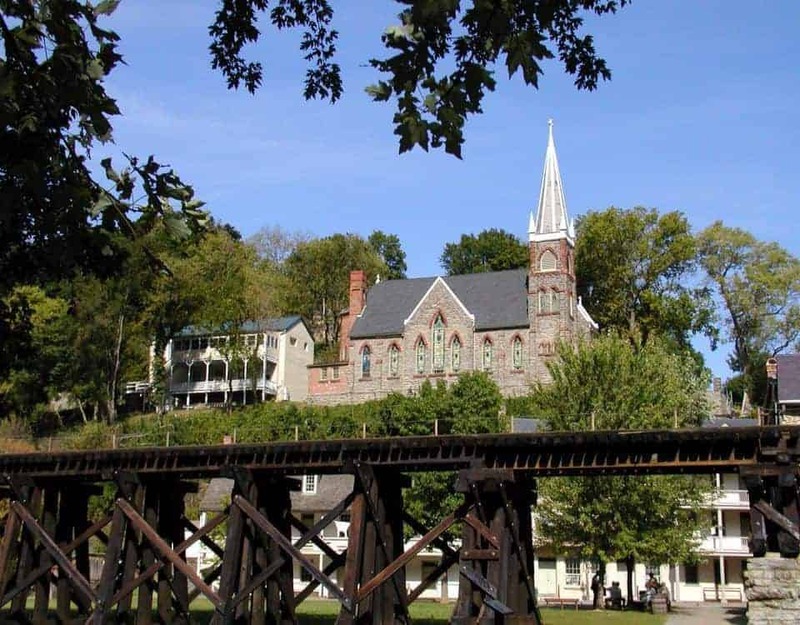 St. Peter's Roman Catholic Church in Harpers Ferry, WV.